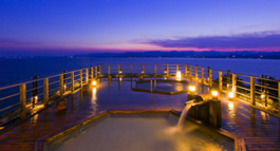 Hotel Wellseason Hamanako is a hot spring resort hotel located at the Kanzanji Onsen on the shores of Hamana Lake in western Hamamatsu City. You can enjoy the sunny gardens from the Garden Court wing, and the magnificent vista of Hamana Lake from the Sky Court wing. It also has the largest hot springs bathing facilities in Shizuoka Prefecture, where you can enjoy 25 different varieties of baths. At the hotel's two restaurants, you can enjoy choice cuisine made with local ingredients. 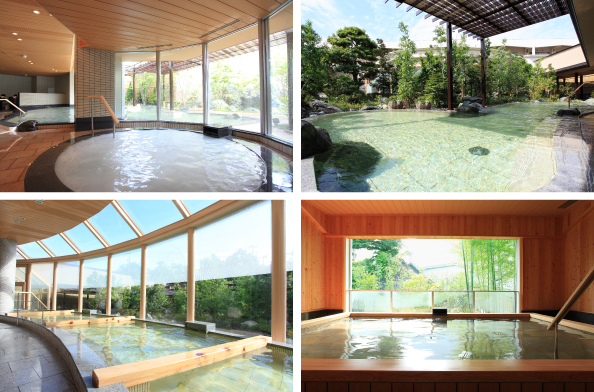 Kanzanji Onsen is a popular destination for tourists, with a variety of leisure facilities in addition to the hot springs such as an amusement park. The popular amusement park Hamana Pal Pal is directly linked to the hotel via a connecting gate, and the ropeway platform and marine leisure spots are close at hand, making it an extremely convenient location for leisurely pursuits. The hot spring district with its easygoing atmosphere is also within walking distance. Hanasaki no Yu is an indoor day spa, where you can enjoy three different bath-houses, Hinoka no Yu, Shakkei no Yu, and Daidarabocchi no Yu. Guests at the hotel can use these hot spring facilities at no charge from 10 AM on the day of check-in to 9 PM on the day of check-out.In addition, they can also use the guests-only open air bath Hitotoki no Yu.For guests who would prefer to bathe in their rooms, all guest rooms have an attached shower booth (some rooms have a bathroom). 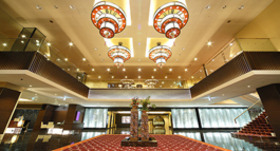 At Lupinus, you can enjoy the enormous buffet using the bountiful ingredients taken from Hamana Lake. 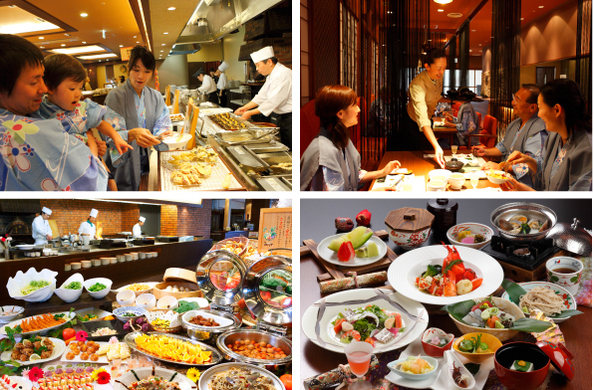 You can freely try a wide variety of Japanese dishes in the buffet. Having the dishes made fresh while you watch, healthy foods made with local vegetables, along with the wide variety of sweets made by a patissier, these are just a few reasons for its popularity. Hanaougi is an intimate space for adults in Japanese-modern style where you can enjoy lavish Japanese-style original kaiseki dining.The kettle-cooked rice served in the restaurant is the finest way to eat white rice.You can choose your main dish from carefully selected meats and seafood , grilled teppan-style. The Garden Court wing is equipped with balconies where you can look down on the sunny, 3,600 square foot gardens, with a variety of room types to enjoy, including a Western-Japanese fusion style with both beds and tatami floor mats. 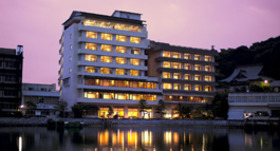 The Sky Court wing commands a view of majestic Hamana Lake. Enjoy the hot springs lodge atmosphere in the traditional Japanese-style rooms. ※If you like the provided shampoo, rinse, skin lotion and moisturizer after trying it, you can purchase more at the shop in the hotel. washstand, toilet with warm water bidet and shower booth (some rooms have a bathroom), television, refrigerator, kettle (some rooms have pots), tea set, safe, and slippers (for indoor use) are included. 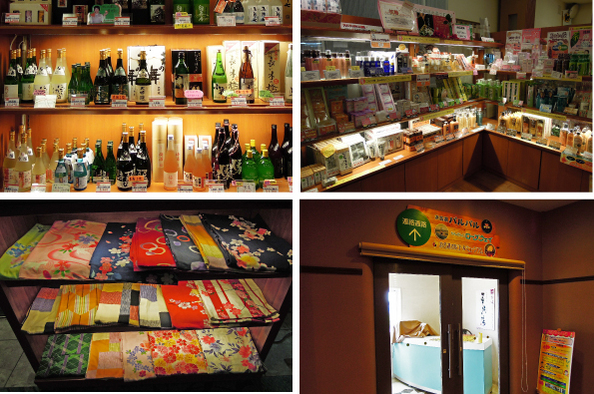 The shop inside the hotel carries a wide array of souvenirs, including famous local sweets and Japanese sake. You can purchase toiletries such as the cosmetics and shampoo provided in the guest rooms and hot spring facilities here as well. You can also rent the yukata robes of your choice for an extra fee. 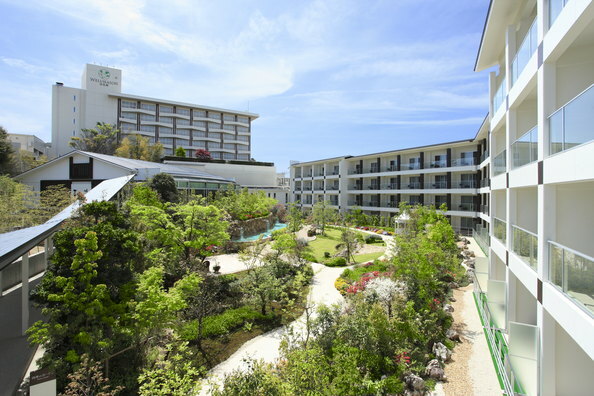 You can easily access Hamana Pal Pal, Kanzanji Onsen and the Hamanako Music Box Museum via the connecting corridors inside the hotel. Take the "Kanzanji Onsen" line bus (46 minutes ride) at bus stop #1 of the bus terminal to "Wellseason Hamanako" then walk (1 minutes). The hotel is completely non-smoking. Please smoke in the smoking room.